It’s summer and you don’t want to spend a lot of time in the kitchen right? Me either. Summer meals are all about not using the oven and getting in and out of the kitchen as fast as possible. From quick prep to quick cleanup, here are three easy dinner ideas that taste delicious and make everyone smile. It never fails. Everytime I make breakfast tacos, the kids ask if we can have them again. What I absolutely love about serving breakfast tacos is it’s a ‘make it your way’ kind of meal. For those who don’t like eggs, they build their breakfast taco with potatoes, bacon and cheese. Since breakfast tacos usually require several skillets, this is an opportunity to get the entire family involved in meal prep. The other great thing about serving breakfast tacos is for those of us who do not eat gluten, meaning the flour tortillas, we have ours on corn tortillas and it taste fabulous. Or, skip the tortilla all together and create a breakfast pile on your plate with whatever you want. This can be whipped up in a jiffy and it’s another crowd pleaser around our home. You can also adapt this to your family’s preference. If they don’t like brocolli, substitute something else green like snow peas. You can make this dish super colorful by adding all different colors of peppers. After experimenting with several different recipes, this one is now my go-to favorite. Double bonus that is also happens to be the easiest recipe I’ve tried. Summer is definitely about firing up that grill and what better to put on that grill than kabobs?! Kabobs are easy to prepare and cook fast. There’s also minimal cleanup involved, which I love. These Quick Chicken Kabobs are absolutely delicious, and as you can see from their picture, kids love getting involved with this meal. What happens if let’s say you either a) don’t have a grill or b) it rains on your parade? Luckily you can cook kabobs under the broiler. Here’s a great article on cooking steak kabobs under the broiler and another one here for chicken kabobs under the broiler. 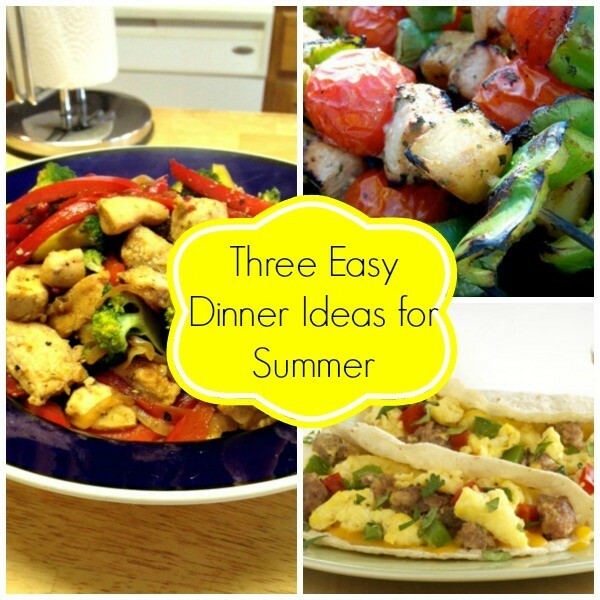 Stay tuned for more easy dinner ideas for summer coming up! Next articleThe Boys and Girls Club of America Want Your Kids to Be #CyberSafe!